What came before the B-type bus? When put into service in October 1910, the B-type was London’s first standardised and mass-produced motor bus, with an unprecedented level of reliability. But what came before the B-type bus? In 1829, George Shillibeer began running the first bus services in London, powered by horses. Throughout the nineteenth century, horses continued to haul the majority of omnibus services through London’s crowded streets. The technology for mechanical buses gradually evolved, but their development was hindered by a number of factors. The Locomotives Act of 1865 (the ‘Red Flag Act’) stated that mechanically propelled road vehicles should not exceed 2mph in towns and 4 mph in the countryside. Furthermore, vehicles were to be led at all times by a man waving a red flag in front. This Act – only repealed in 1896 – plus concerns about road surfaces meant mechanical traction did not develop as quickly as it might have done and horse power continued to dominate until the late nineteenth century. The first notable attempt at a mechanically operated bus was invented by Walter Hancock and introduced by the London and Paddington Steam Carriage Company in April 1833. Named ‘The Enterprise’ the steam bus ran between the City, Islington and Paddington. In 1836 another steam bus was introduced by Hancock called ‘Automaton’. It successfully made over 700 journeys between Paddington, Islington, Moorgate and Stratford during its operational life. In 1889 the first battery-electric omnibus, albeit unsuccessfully, was tried by Radcliffe-Ward. Built as a single-deck vehicle, it reportedly had a top speed of 7 mph but never entered service. 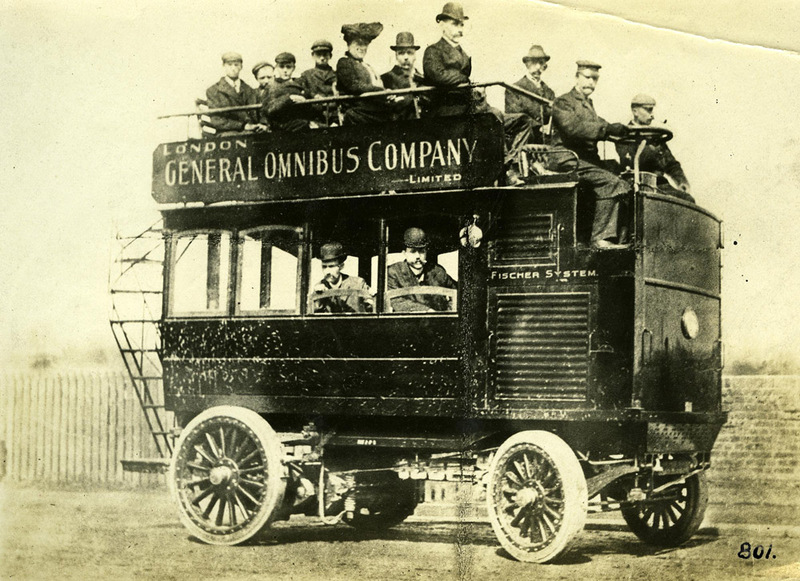 In June 1902 the London General Omnibus Company (LGOC) introduced a Fischer petrol-electric bus, but it’s cumbersome size and high petrol consumption was prohibitive. The LGOC then introduced a steam bus from October 1904 to June 1905 between Hammersmith and Piccadilly Circus, and although it lost them money, it convinced the company that mechanical traction was the future. It is interesting to note that the main focus initially was on steam or electric engines, rather than petrol. However, it soon became clear that the petrol motor bus would win out. 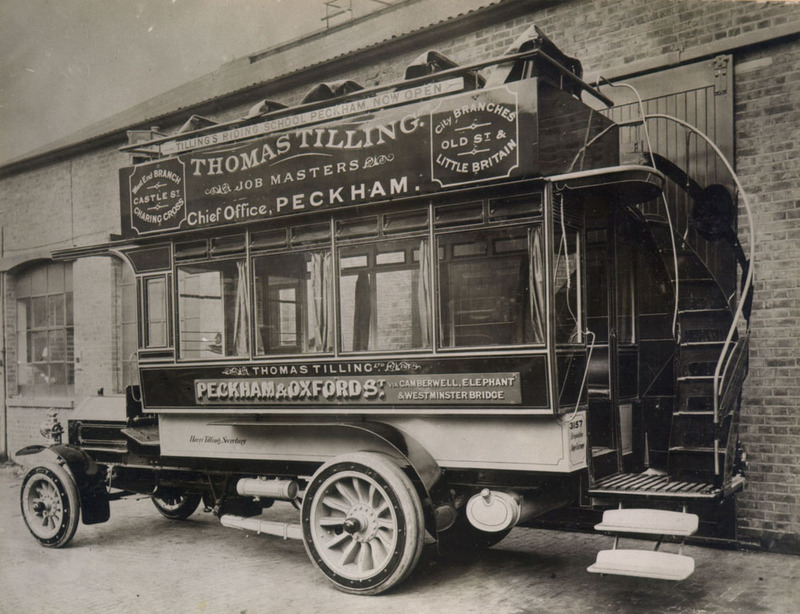 The introduction of the Milnes-Daimler double decker – first used by Thomas Tilling’s – was highly influential in bus development from then on. It first entered service on 30 September 1904, the same year that LGOC set aside £20,000 for motor bus development. Despite further experimentation, motor buses were still unreliable and since there were so many different bus companies, financial difficulty and unproductive rivalries were commonplace. Subsequently, the bus companies came to a decision that they should amalgamate and on July 1 1908 LGOC, Vanguard and Union Jack came together into a greatly enlarged LGOC. With this expansion, LGOC decided it was a better idea to just build its own bus using Vanguard’s overhaul works at Walthamstow. The best features of the wide variety of buses of the previous years were combined into a single bus, named the X-type, until the more refined B-type was completed on October 7 1910. The genius of these new buses was that the parts were made to such fine measurements that they could be interchanged between buses, increasing reliability and decreasing maintenance costs. The B-type saw revenue and shares leap, and in January 1912 LGOC was taken over by the Underground Electric Railways Company of London. The success of the B-type, however, was the result of years of trial and error.